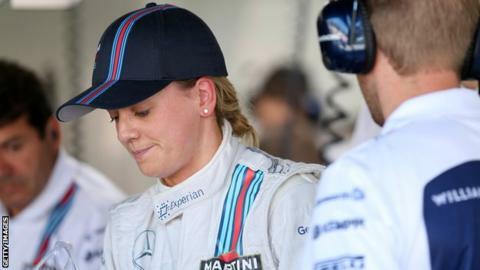 Former Williams test driver Susie Wolff says F1 boss Bernie Ecclestone is not against female drivers but feels she has disproved his view that women are not strong enough for the sport. Ecclestone has also stated that women would "not be taken seriously" in F1. "My belief is that a woman can be successful in Formula 1," said Wolff. "A woman can be physically fit enough to drive a Formula 1 car. I did the race distance in Barcelona so I have proved that it is possible." Wolff has founded Dare to be Different, an initiative which aims to increase the number of women in motorsport. The 33-year-old revealed she had spoken to F1 boss Ecclestone on Wednesday regarding his controversial comments, made at the Advertising Week Europe conference in London. Ecclestone's remarks provoked a fierce backlash. American Leilani Munter, who races stock cars in the ARCA Racing Series, has described Ecclestone as "an embarrassment" and "just a sad, pathetic, sexist old man with pre-historic views of women". Wolff told BBC World Service: "Like anybody else, when I heard the comments at first I thought 'wow, how could he have said that?' But when I looked into it, the comments are taken completely out of context. "There was a much wider interview around the topic and actually his comments weren't as bad as they sounded. "I'm not on the defensive for Bernie here. We agreed on some topics and I can only be completely honest that every step of the way in my quest to make it on to the Formula 1 starting grid he's been supportive. "I don't think it's fair to say that's he's against woman being in Formula 1 and he also did say in the interview that it would be the best thing for F1 on the commercial side to have a successful female driver." Wolff started working with Williams in 2012, after racing for seven years in the German Touring Car Championship, before retiring last year. She spent three years involved in test and development work and drove in four practice sessions over the 2014 and 2015 seasons - becoming the first woman to take part in a grand prix weekend for more than 20 years. "One of the whole reasons for starting my initiative, Dare to be Different, is about getting more girls interested in motorsport and that's everywhere, not just driving on track but creating a network where they have the support around them," added Wolff. "In a situation where they may feel negative after reading such a thing [as Ecclestone's comments] they can tap online into the community they've joined and get support from lots of other woman who are successful in the sport. "I would like to think we are much closer to a female F1 driver but I could never give you a timeframe."